Vald, a Nord bandit, is an associate of the Thieves Guild in Riften. Vald previously completed jobs for Maven Black-Briar, but during a job in which he was transporting the Quill of Gemination across Lake Honrich, he crashed the boat and lost the quill. Since then, he has been in debt to Maven, and works as a guard watching over Riftweald Manor, which is owned by Mercer Frey. 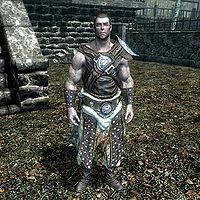 Vald is equipped with a leveled cuirass and leveled boots as well as having a 50% chance of wearing leveled gauntlets. The best quality he can be equipped with is scaled. He also carries the key to Riftweald Manor and between 25 and 125 gold coins. In combat, he relies on an iron dagger and a leveled one-handed weapon (up to elven quality). The first you hear of Vald is from Brynjolf when telling you about Riftweald Manor: "A gift from the Black-Briars after they kicked the previous family out... place called Riftweald Manor. He never stays there, just pays for the upkeep on it. Hired some lout by the name of Vald to guard the place. Just find a way in, get the information and leave. And you have permission to kill anyone that stands in your way." If you ask for advice on getting inside he'll chip in: "Good question. I've only set foot inside a few times myself and that was in Mercer's company. If you can get past his trained watchdog, I think your best bet might be the ramp to the second floor balcony in his backyard." If you press him regarding "the watchdog" he'll point you in Vex's direction: "That'd be Vald. A real piece of work, that one. Mercer's holding something over his head, keeping him loyal. Talk to Vex. She used to know him very well... if you catch my meaning." Most of Riften seems to have a low opinion of Vald, and that extends to his former lover Vex: "That pig? Oh, I have info on him. More than you care to know." When you ask her how to get on his good side she'll laugh you off: "Vald? Good side? I think you have the wrong person. The only thing Vald understands is gold. A man after my own heart." When you suggest bribery she'll suggest talking to Maven Black-Briar: "Sure, but he'll ask for a whole lot. I mean, you are asking him to betray Mercer Frey. Your best bet would be to erase his debt with Maven Black-Briar. If you talk to her, she might be able to give you the details. Of course, you could just run him through and take what you need off of his corpse... I could care less." You can either see Maven or head directly to Riftweald Manor. As Brynjolf mentioned, Vald isn't particularly friendly: "This is Mercer Frey's place and he don't like visitors. Now go away." If you tell him that you need to get inside he'll dismiss you: "No visitors. No way. Now piss off, before ya' make me mad." You can either bribe him or try to persuade him, the latter being quite hard. Try to intimidate him, though, and he'll just laugh you off. If you attempt to bribe him he will admit his debt problem with Maven: "You ain't got enough coin to make my problems go away unless ya' can talk Maven Black-Briar into letting me outta' my debt. You try and set one foot in this yard, and I'll cut it off." If you pay Maven a visit and offer to clear the debt, she will provide a scathing portrait of Vald: "Vald? Why would you want to help that idiot? He owes me a steep debt. In fact, he's lucky all I did was force him to work for Mercer." If you inquire further she'll explain: "A few years back, I commissioned a unique quill from a good friend of mine in Winterhold. Vald was tasked with getting it here safely and it ended up at the bottom of Lake Honrich. The wizards called it the Quill of Gemination and demanded a tremendous amount of gold to have it made. If you can locate the quill and return it to me, something Vald was too stupid to do himself, I'll consider the debt satisfied." Asking her how the quill ended up on the bottom of lake provides further proof that Vald isn't the sharpest tool in the shed: "I had Vald meet the caravan from Winterhold on the western end of the lake so he could avoid the roads. The idiot got lost in the mist and ran his boat right over some rocks, sending it straight to the bottom. He's too stupid to remember where he was, and any attempt I've made to find it in the past has been unsuccessful." If you manage to pay off the debt Vald will be ecstatic: "I don't know how ya' talked Maven into letting me go, and I don't care. You did something for me, I'm gonna do something for ya'. Here, take the key to Mercer's house. Won't need it any more." Whichever non-violent route you take to enter Riftweald Manor, Vald will disappear from the game when the quest is over. Vald was a level 1 NPC prior to Patch 1.9. Even if you kill Vald, you will still have the dialog option to erase his debt with Maven. Attempting to erase Vald's debt after he is dead will still earn you leveled gold, but you will be unable to complete the quest by delivering the letter of pardon. The quest and item will stay active. If the undelivered letter bothers you, it seems you can place it on owned bookshelves. It's possible that Vald won't come talk to you at the gate when you bring him the note to clear his debt, becoming hostile toward you instead. You can also try using Pacify if he becomes hostile and you don't wish to kill him. The Bend WillDB shout has the same effect and may work if Vald's level is too high for pacify. This page was last modified on 9 August 2018, at 07:44.